There's something about February being special not just because most of the people celebrates the feast of St. Valentine's day but because it is during this season that couples, husbands and wives, boyfriends and girlfriends, even families go out and express their love and affection to one another, thus a celebration of LOVE. There is no denying that the month of February specifically the 14th somehow is considered as the most romantic day of the year. And do you know that February 14 became known today as a day to celebrate romantic love aside of honoring Saint Valentine? Considerably, it was not until Geoffrey Chaucer, known as the Father of English Literature through his poem the Parliament of Fowls, associated it with romantic love. The poem with 699 lines and has the form of a dream vision of the narrator, is one of the first references to the idea that St. Valentine's Day was a special day for lovers. Beyond all of these, it comes as no surprise that February 14 is one of the most celebrated days of the year, and happens to be one of the busiest days for hotel and restaurant industry. Hotels, Restaurants, Resorts create special packages to enjoy the Valentine season. With this, we have identified hotels and restaurants within the Metro tailored to celebrate Valentine's Day. Either you are passionately in love, and a true believer of amorous intimacy, or just wanted to enjoy the evening alone and/or with friends and families, here are some of the places to spend it. We put together a list to ensure your celebration is worthwhile and spend the evening worthy of a great fairy tale and of-course, a taste of romance. Limketkai Luxe Hotel, a homegrown brand considered to be the tallest and biggest hotel in the metro, and endorsed as the first Gold hotel in the country, located in one of the busiest avenues in the city is offering the Valentine season with a Musicale Valentine Dinner Buffet entitled "A Musicale Valentine Dinner Buffet" at KaVe Restaurant. 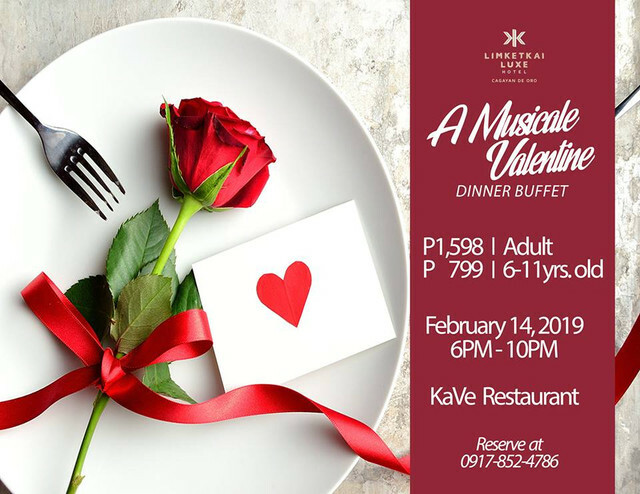 Known for its luxury and hospitality, Limketkai Luxe Hotel's Music Valentine Dinner will be accompanied with the Lourdes College Strings. Rate per adult is at P1,598 while for kids at P799 from 6-11 years. The evening is sure to be filled with delectable cuisine with its gastronomic offerings, and soulful music for entertainment. For reservation, please reach the following number: 0917-852-4786. Apple Tree Resort and Hotel, located in Taboc, Opol, Misamis Oriental is considered as the premier resort and hotel in Misamis Oriental and Cagayan de Oro with a three star category. 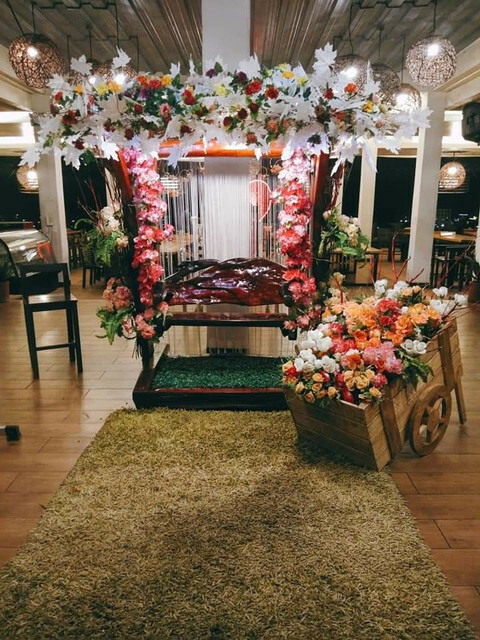 Apple Tree Resort and Hotel has created a series of romantic experiences this valentine season through "Romance By the Bay" introduced last 2015. 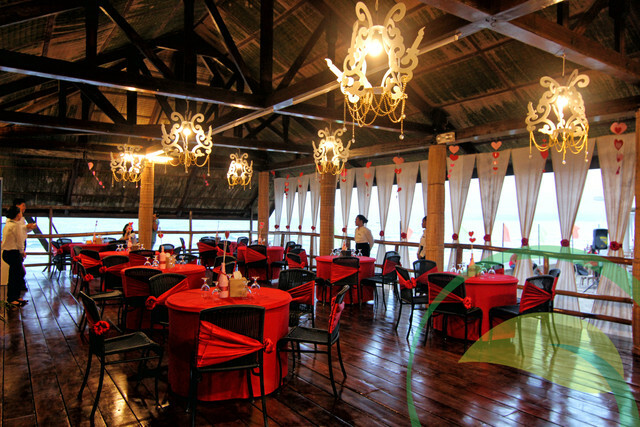 With the great ambiance, the calming atmosphere of their Infinity, and Sea Horse-shaped pools and the magnificent view of overlooking ocean, Macajalar Bay and the Camiguin Island, Apple Tree's Romance By the Bay makes it as a distinctive destination for an intimate celebration which comes with the delicious and enticing creations of their chefs through the valentine dinner buffet. Either you choose at the Pavilion, Beach Front, Erlindo's Restaurant, or Al Fresco, the Resort sets the stage for an ultimate Valentine season. The evening will be celebrated with a live acoustic entertainment and a glass of wine while discovering the soothing power of the ocean breeze. 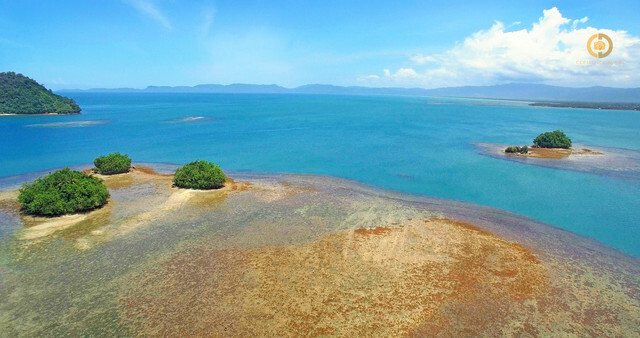 Did we say that the hotel rooms are right by the sea? Surely, you will enjoy the beauty of the sunset at Apple Tree Resort and Hotel. Special room packages are also created for romantic experiences especially for couples, and families without to leave the metro. There's nothing sweeter than celebrating the day of love with the people you cherish most. And if you a fan of celebrating it at clubs, this one is for you! 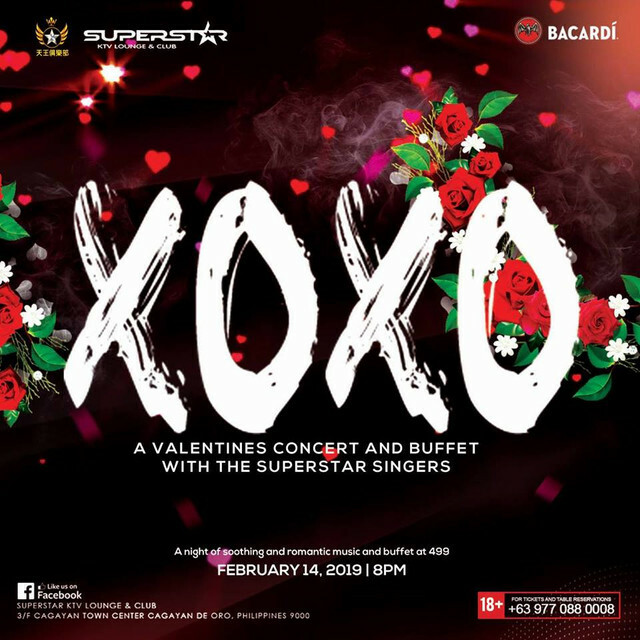 Superstar KTV Lounge and Club, an upscale club opened last August 2018 that offers its exclusive KTV rooms with an inspiration of European art, and houses stylist discotheque design will give you a night of the best love songs while dining on scrumptious dinner buffet through "XOXO", a valentine concert with and buffet with the superstar singers. And for those that want to reserve for the VIP Rooms for the night, it will be at Php5,500 only with 2 Free Wines. Book your tickets and reach this number 0997-088-0008. 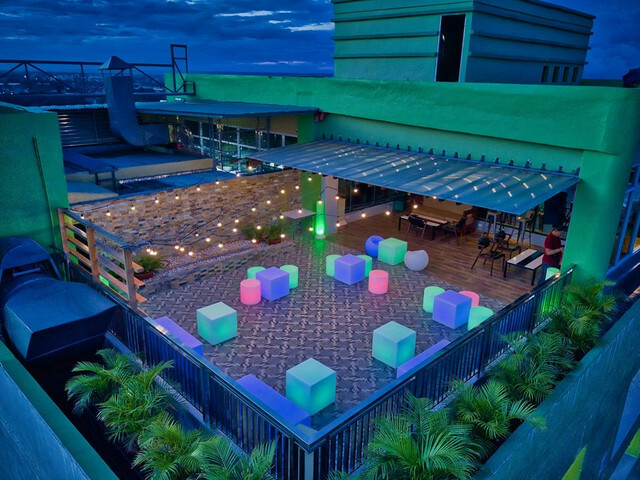 New Dawn Hotel Plus is one of the newest hotel accommodations in the city that offers an upscale roof deck. The hotel is a great venue for valentine season as it offers a 360 degree view of the cityscape especially during the evening. 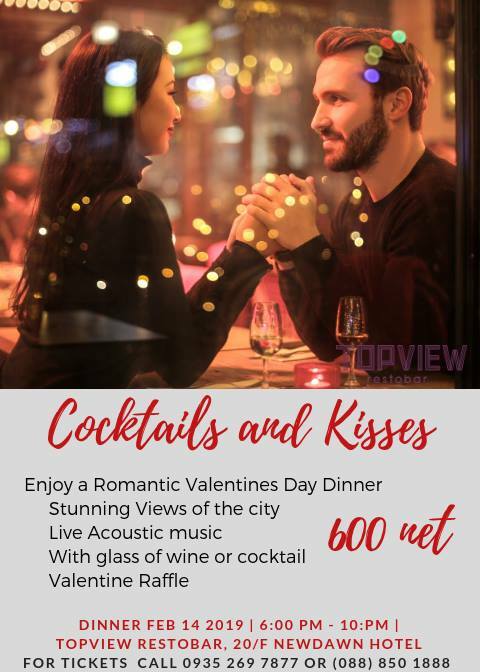 New Dawn Hotel Plus dinner buffet will start from 06:00pm to 10:00pm at P600 per person and offers a non-pork buffet with 4 viands, soup, salad, desserts, and drinks at the famous rooftop bar and restaurant. It comes with free glass of wine or cocktail, valentine raffle, and live music entertainment. 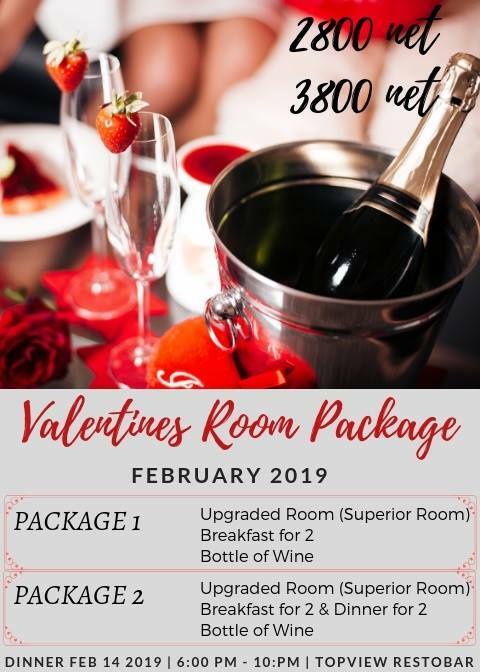 Special Room Promotion for the #Love Month are also included. For all days of #February avail the Valentine #Romance Room Packages. Book a special treat for your loved ones with dinner buffet over gorgeous views only at Topview Restobar at Newdawn hotel plus. Discover an array of exquisite flavors matched by fine wines and romantic music in an intimate ambiance. 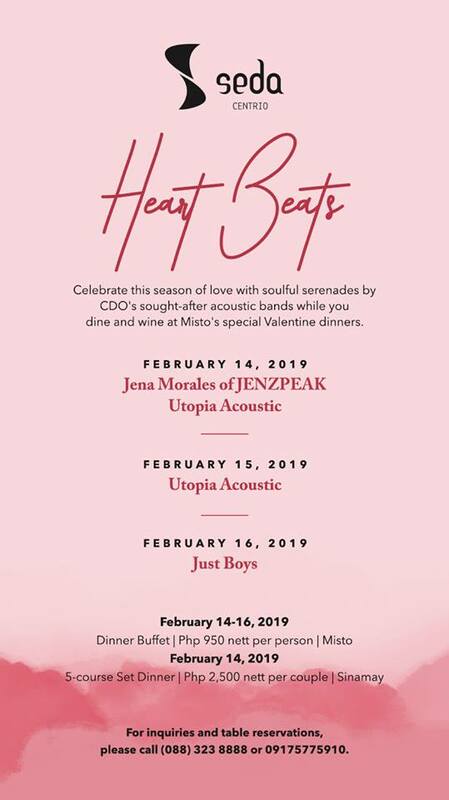 Let love takeover this Valentine weekend as Misto lines-up Cagayan de Oro's most sought-after acoustic groups to perform live. Catch them from February 14-16, 2019 with their best rendition of classic love songs to fill your hearts with warmth and memories. For inquiries and table reservations, please call (088) 323 8888 or 09175775910. You may also email cdo@sedahotels. The Misto is located on the 4th Floor of the hotel. This promotion has limited availability. Revel in a gastronomic celebration of lush flavors amid an elegant ambiance setting and idyllic soulful serenades to ignite romance for this season of love. Rediscover romance while indulging in well-appointed rooms, an intimate dinner experience, and other perks to help you create those lasting memories with the one who matters most. Love is definitely in the air at Ultrawinds Mountain Resort, one of the highest peak resorts in the metro. 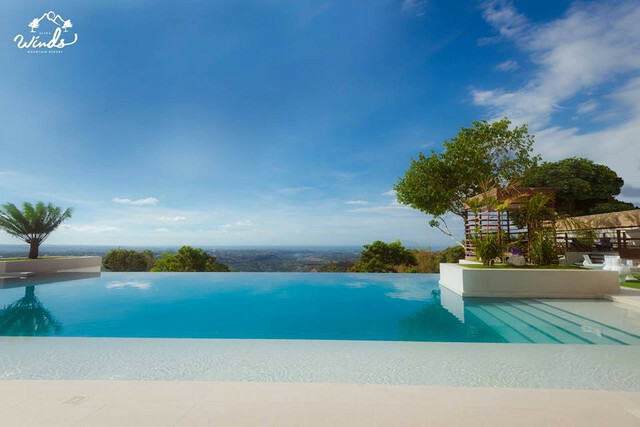 Technically located in Bukidnon, the Resort is accessible through the CDO Convention Center and offers the panoramic view of the city. Make this Valentine’s Day the most memorable one yet, with a scrumptious dinner buffet, set in a stunning ambiance that will inspire love and romance. Starts from 6:30pm, enjoy the evening with a selection of love songs performed by the live band. 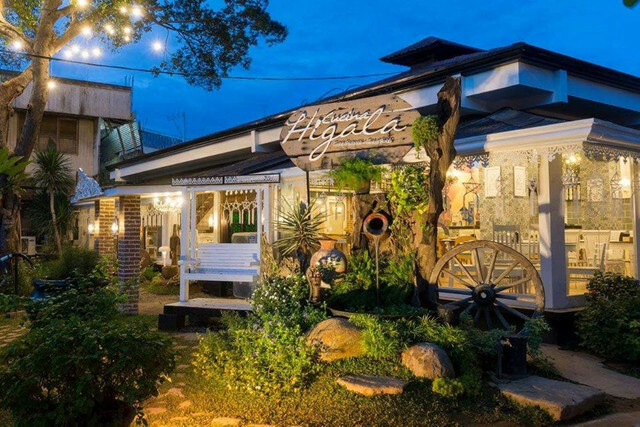 The award-winning homegrown brand, and considered as one of the top restaurants in the city, Cucina Higala has the reputation of delectable and wide array cuisines. 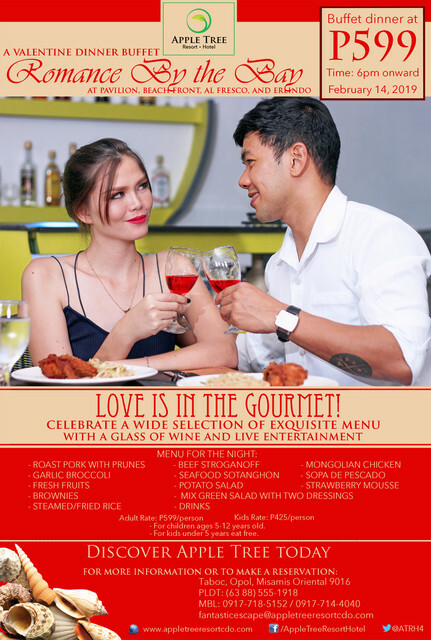 On Valentine’s Day, indulge your senses with Cucina Higala's Valentine’s Love Menu! 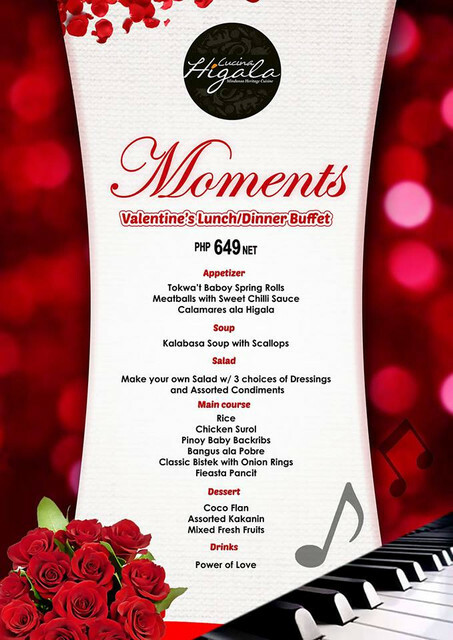 MOMENTS, as they call it, the valentine celebration will start with a lunch buffet at P649 per person to be followed by a dinner buffet. 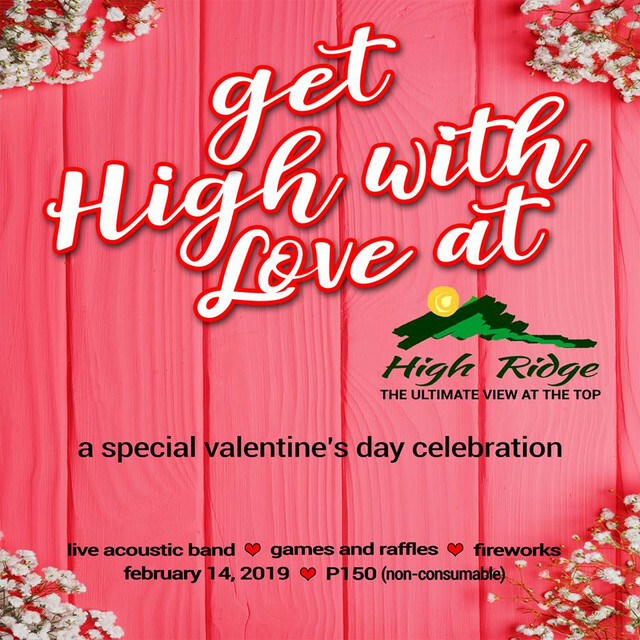 Bring your FRIENDS and LOVED ones on VALENTINES Day (February 14, 2019) and let's get High with LOVE at HIGH RIDGE RESTAURANT from 3:00pm until 12:00 midnight. Featuring LIVE Acoustic Band, Fireworks, Lovapalooza and Raffles. Tickets sell at P150, non-consumable. 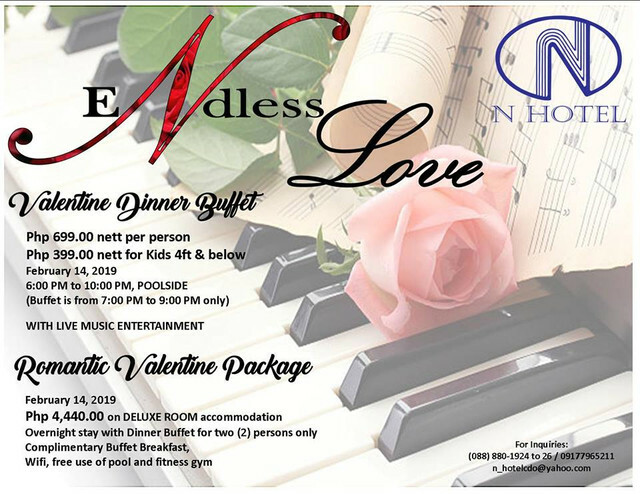 Celebrate LOVE with friends and family at N Hotel with their Endless Love Valentine Dinner Buffet at P699 per person (adult), and P399 per kid (4 feet and below). The valentine dinner buffet will start at 06:00pm to 10:00pm at their poolside which comes with live music entertainment. Seasons of Love is Here! Don't just fall-in-love, but get lucky this Valentines! 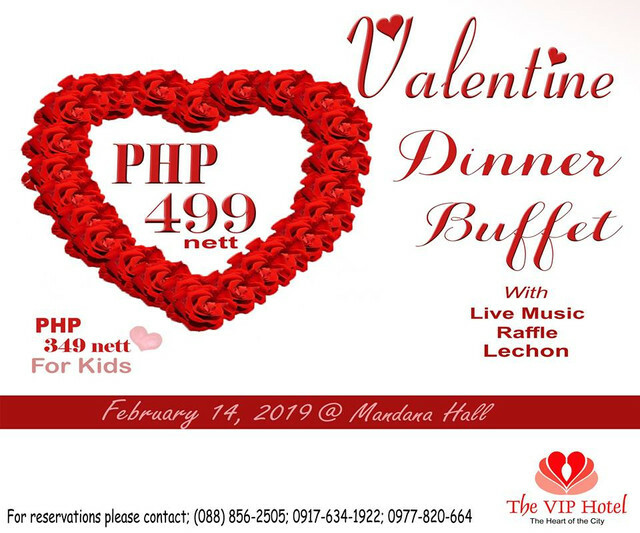 Valentines Dinner Buffet for only P499 per person with equivalent to 1 raffle ticket (Win Awesome Prizes!) 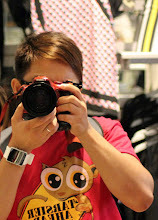 and Php 349/Kid (Ages 5-11 years old). 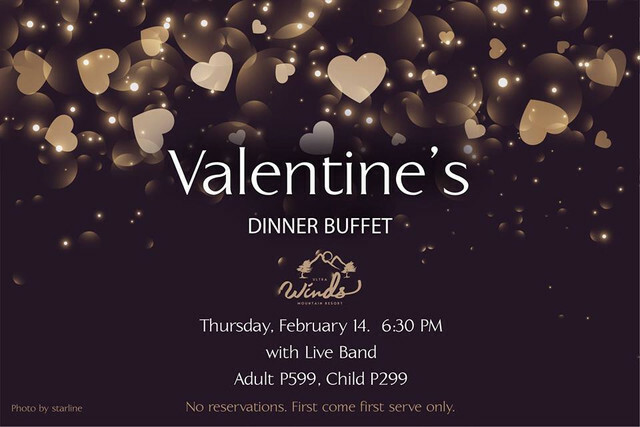 VIP Hotel's Valentine dinner buffet includes 4 main courses, with lechon, 1 pasta, 2 soups and 3 dessert choices and this comes with live music to serenade the guests. For inquiries and reservations, please contact (088) 856-2505; 0917-634-1922, 0977-820-664 or visit the Sales Office of The VIP Hotel.